The weather reporter stared maniacally into his camera. “We might have to measure the snow in feet!” he cried. I sighed. It wouldn’t be the first time. The occasion is the current arrival of Winter Storm Bozeman. We have already experienced the lake effect snow of last weekend. Now Bozeman is here, bringing with it colder temperatures and wind. The real issue, though, is that Bozeman is triggering more lake effect snow. Oh, joy. Eighteen years ago, we had a November that featured a week of snow. Each night, we received 8″. The days were bright and clear. (This is the nature of lake effect snow. Cold winds come across the warm lake in streams, known as “bars”. Blue skies alternate with snow clouds and the amount of snow you get just depends on where you are standing at any given moment.) Overnight, however, it would snow and dump an additional 8″ on us. This went on for over a week. By day 6, roofs started to collapse. A Level 2 travel emergency was in effect, which is to say, only medical and emergency personnel (fire, police) were allowed to drive. So much snow had been plowed off the roads, that you literally could not see around corners at intersections. All you saw was a wall of snow. This went on for 9 days, then blessedly stopped. Ironically, we did not have another measured inch of snow for the remainder of the winter. Gaia has her playful way with us. Last week’s snow was officially 13″ here. The Temple of Gaia apparently lacks a ruler or yardstick. 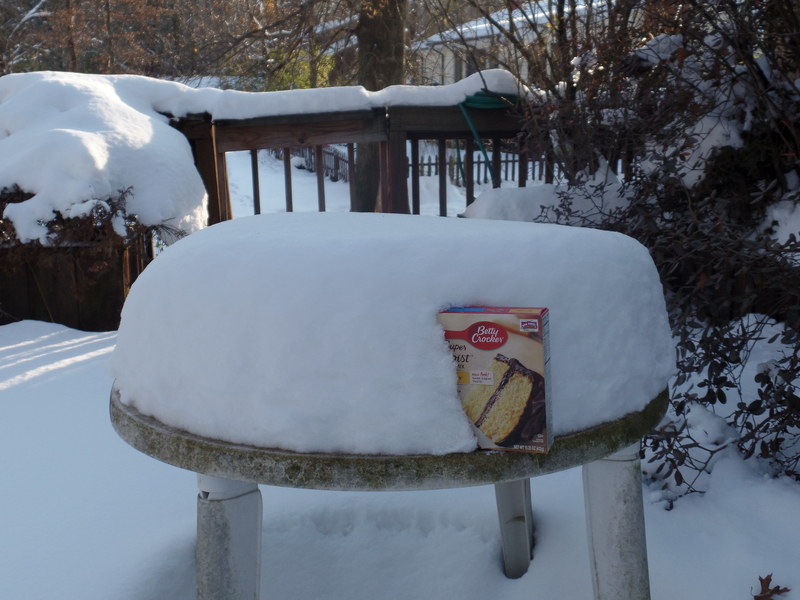 I needed a standard unit of measurement to give you a sense of how much snow we had received. So, I used a Betty Crocker cake mix box to give you a sense of what gifts Gaia has bestowed upon us. Since we are taking pictures, why stop here? This is a view of the back of the Temple grounds as well as the farmlet’s next door. The willow tree is on the left. The pens for the goats and chickens are on the right. If you look behind the willow, you will see the snow edging another row of trees. 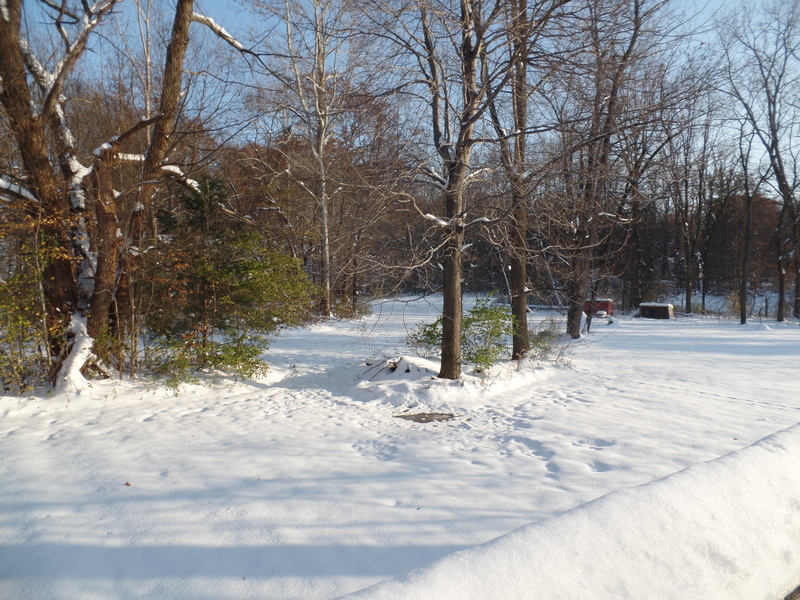 Follow the snow line through both yards, and you will notice the undulating curves of the woods. That line delineates the riparian area for the creek which flows through both properties. Our buildings sit atop an archaic creek bed, which is what you are looking at if you focus on the center of the photo. If you look carefully, you should be able to glimpse the path that leads to the Temple’s outdoor altar. 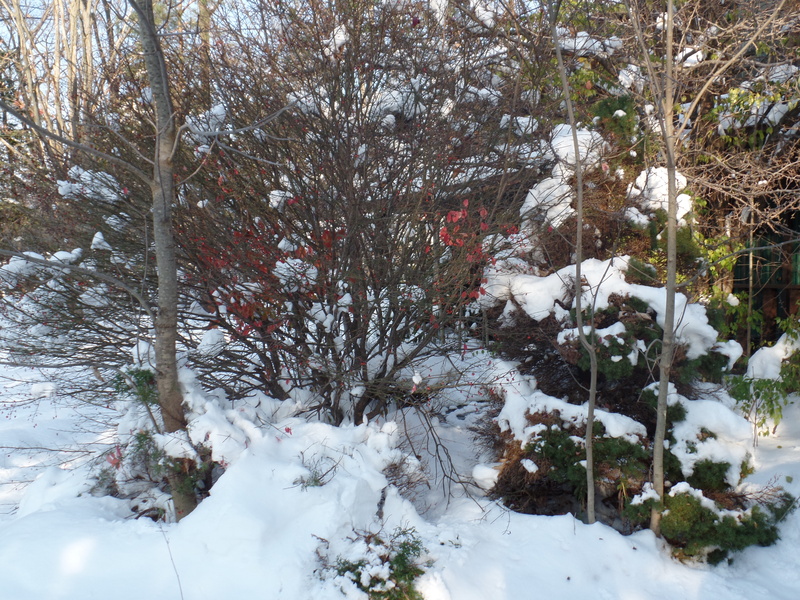 The red in the center are the residual leaves from the burning bush which graces the path. There are several bird (squirrel, raccoon) feeding stations surrounding the outdoor altar. This sacred space is blessed with the music of their songs. So far, the Temple has missed additional snow from Bozeman (the bar’s edge is about a mile and a half east of us). However, we have two more days of weather in this system. We shall celebrate Gaia in Her glory and care for Her wild and domestic creatures to the best of our abilities. May all those you love and care for be safe and healthy as well. Great to see your beautiful property at last. And the snow. Stay warm.